There are a many types of ablations available to patients with abnormal heart rhythms. Pulmonary vein isolation – Most atrial fibrillation (AFib) signals originate in the pulmonary veins. Ablations are performed to create many lesions (scars) to form a circular scar around the four pulmonary veins during this procedure. The scar thereby blocks any impulses firing from within the pulmonary veins to reach the rest of the heart, thereby “isolating” or “disconnecting” the pathway of the abnormal rhythm. Ablation of the AV node – An ablation is performed to damage the AV node (the electrical bridge between the atria and ventricles). 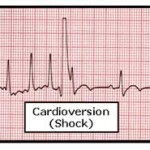 This results in a very slow heart rate, since the electrical signals from the atria can’t travel down to the ventricles. To maintain an adequate heart rate, a permanent pacemaker is then required. In Atrial Flutter, the electrical signal travels along a pathway solely within the right atrium. It moves in a circular organized motion, or “circuit,” causing the atria to beat a lot faster than the ventricles. The fast, but regular pattern of AFL is what makes it different from AFib. AFL makes a very distinct “sawtooth” pattern on a test used to diagnose abnormal heart rhythms, the electrocardiogram (ECG). 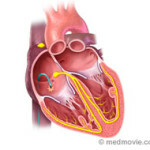 Atrial flutter ablation is performed by applying energy to a spot in the right atrium named the isthmus to stop electrical signals from traveling through this spot. There are numerous ablation techniques related to the type of energy used, type of catheter used, and the types of lesions created. Radiofrequency ablation – A special catheter that delivers radiofrequency energy is used to heat the heart tissue and produce a lesion. Cryoablation – Extremely cold temperatures are emitted through a probe (called a cryoprobe) in order to create lesions. 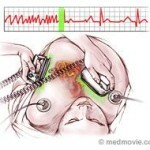 Surgical ablation – Surgical procedures can also be used for treating AFib. These procedures can either be traditional open surgery or minimally invasive, and can be combined with other surgical procedures such as valve repair or replacement or cardiac bypass surgery.